In most cooling applications, chillers use a pump to circulate cool water or refrigerant to whatever it is designed to cool. This liquid then removes any heat from the process (the system or machine it is cooling) and returns to the chiller, which is how the heat transfer takes place. The type of refrigerant that used depends on the application and the temperatures required. They all work in loosely the same way though. Using a compressor and phase-change (changing a liquid to a gas in this instance, without changing its chemical composition). The process of changing refrigerant from a gas to a liquid, and back again, is known as the refrigeration cycle. The refrigerant cycle starts with the compressor taking low temperature and pressure vapour and compressing it into high temperature / high-pressure vapour. The vapour then moves onto the condenser. Using forced air movement or cooled regulated water the vapour is condensed into a saturated liquid which then moves down the liquid line through a receiver and drier to the expansion valve. The expansion valve will regulate the flow of the saturated refrigerant into the evaporator using its orifice, which will dramatically reduce the temperature of the refrigerant as it enters the evaporator. At this point, the heat from the process is transferred into the refrigerant (heat exchange). As the refrigerant is absorbing the heat rejected from the process it evaporates back into a vapour and is returned to the compressor. This completes the cycle. The condenser uses a process of forced air movement or flow-regulated water to condense the refrigerant into a saturated liquid – this then passed through the liquid line and into the expansion valve. Note: If the condenser gets blocked, the refrigerant won't be fully saturated. You may find that you have flash gas at the expansion valve, which will cause a dramatic reduction in the efficiency of the cooling. The compressor takes cool, low-pressure vapour refrigerant and compresses it, increasing the pressure and so that it becomes hot vapour. 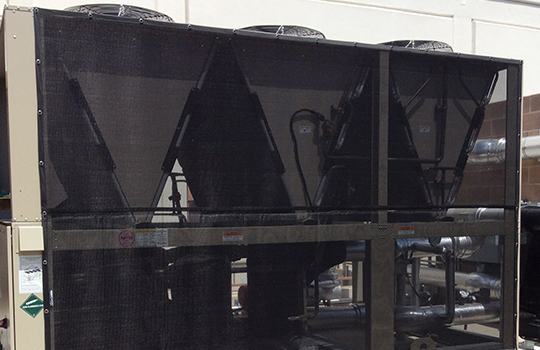 The evaporator is used to cool the water or air to deliver process cooling or air conditioning. As refrigerant is forced through the expansion valve orifice and into the evaporator, it enters the sub-cooled liquid phase. It is at this point that, through fan coils or shell and tube/plate pack heat exchangers that the low temperature from the refrigerant gets transferred into the high-temperature part of the process – latent heat exchange. The coolant is then evaporated because of the change in temperature, changing it back into a vapour and returning it to the compressor to complete the circuit. The pump circulates coolant to the evaporator from the holding tank and from the evaporator to the machine (or process) requiring cooling. The expansion valve is designed to control the flow of refrigerant into the evaporator. For an efficient refrigeration system, two fundamental parameters must be present – the correct air or water flow rate for the evaporator, and the right refrigerant saturation from the condenser. Due to the high manufacturing costs of chillers, these units tend to have limited built-in redundancy when specified, which means that their efficiency often depends on the environment within which they are working. If the equipment is situated somewhere that is vulnerable to large amounts of airborne particulates, like dust and pollen, for example, the coefficient of performance (COP) will gradually reduce as the condenser gets contaminated. If the COP becomes reduced because of this contamination, the risk of breakdown and equipment downtime becomes far higher because it must work far harder. Regular maintenance requires one of the costliest factors of a facilities contract – a maintenance engineer’s time. We've made it our mission to help reduce the maintenance engineers spend on site maintaining chillers with an incredibly simple solution: The air intake screen.